In the longest shiur ever, Rabbi for Los Angeles gives 18 hour shiur and raises $250,000 to help alleviate high cost of Jewish Day school. Say goodbye to complaints that seven-minute shiurim between mincha and maariv are too long. Imagine: 18 hours of a live streamed, non-stop shiur. That was the feat accomplished by Los Angeles’s Rabbi Shlomo Einhorn last week on Thursday. He created a shiur that would rival any in the world in terms of length, and proceeded to stream it live, on Youtube, where it will stay for posterity. The idea came to Rabbi Einhorn, while he was overhearing a conversation that his wife was having with another woman. “The woman simply wouldn’t let my wife hang up. She kept going and going. I thought to myself, wow she is going to break a record.” It was that moment of inspiration said Rabbi Einhorn that led to the possibility of the idea of breaking a record by giving a shiur for 18 continuous hours. The impetus for the actual shiur was to create a fundraising effort to help families afford private Jewish day school. “The burden of private education is so expensive, because the quality has increased, it has made it very difficult for the average family to afford proper private Jewish education in schools around the US.” Einhorn set out to reach the goal of raising $250,000 during the 18 hour Torah marathon. Last Thursday he succeeded in his goal, and the money will be donated to Jewish day schools in the area of Los Angeles to ease the burden on parents of affording Jewish day school education for their children. "The cost of day schools is exorbitant, but that is because the quality of education has gone up," said Rabbi Einhorn in an interview with Arutz Sheva. Einhorn relayed that while some people thought that it would simply be him sitting in front of a computer camera with a gemara, the actual shiur was a far bigger production. “It was a huge production, we had a live audience at all times, we had two huge trucks and a live production team working in shifts.” A website was created to both stream the shiur and to accept and monitor the donations. The shiur included shacharit, during which Rabbi Einhorn gave an explanation on tefillah, while he was mic'ed, he spoke quietly so as not to disturb the other attendees of the minyan. “Naturally, I did not talk from baruch sheamar until after shemonah esrei,” he quipped. After Tefillah came a daf yomi shiur, and by then Rabbi Einhorn was more than a few hours into the shiur that would break world records. He began at midnight on December 25th and provided Jews around the U.S. some much needed, round-the-clock Torah video that they could watch in order to escape carolers. Local Rabbis came to attend the shiur and show their support, and students from the school where Rabbi Einhorn is the head Rav came and participated as well. What is even more surprising is that other private schools and yeshivot from around the country cancelled classes and had their students watch the shiur instead. 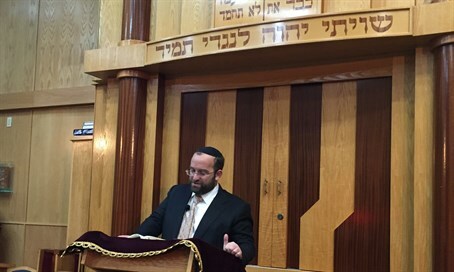 Rabbi Einhorn works as the Dean and Rabbi of Yavneh middle-school of Los Angeles. His response to the shiur was one of joy. “I loved doing it. It was really enjoyable. The shiur and the length of it was inspiring for myself to want to do more and learn more.” Rabbi Einhorn said that while he is not sure if he will try to break his own record next year, he will likely think of something to help keep the ball rolling.